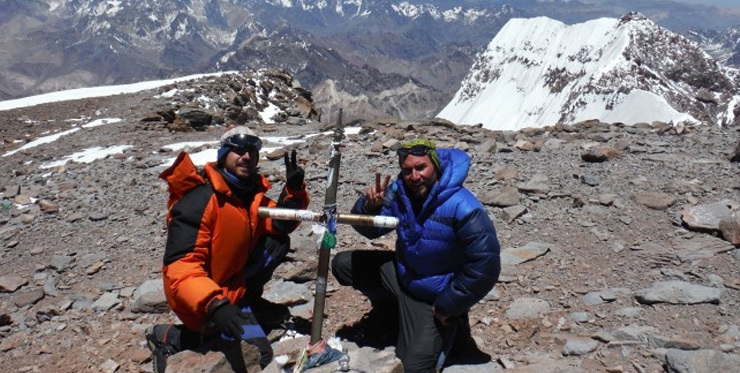 Our program reach two Andes icons, the highest mountain in South America and the Southernmost 6000 in the world, mt Marmolejo (6108masl). 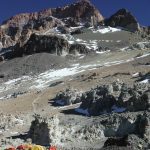 We climb Marmolejo to have the best posible acclimatization process before try Aconcagua. 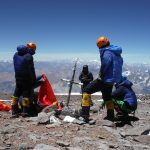 In 8 days in Chile we reach summit in Marmolejo, another day resting in Santiago and another 10 days in the Parque Provincial Aconcagua including 1 extra day to attemp summit in case of bad weather. 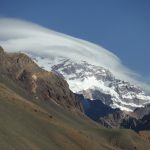 Aconcagua is the highest Mountain along the Andes Range and named by the Quechua culture as the White Sentinel, similar to what was called by the Aymara culture who named it The Stone Sentinel. 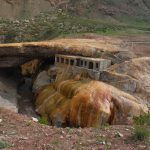 It is placed in Argentina very close to the Chilean capital city of Santiago. 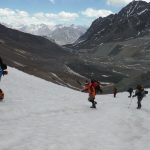 Annually it is visited by hundreds of mountaineers from all around the world who are trying to achieve this objective which is without further questions, a great challenge to any mountaineer professional. Private Service: You choose the best convenience date for you and your group. Price depending on number of people booked. This Day we meet at the hotel or in our agency to review the itinerary, guides presentation and check the personal equipment. 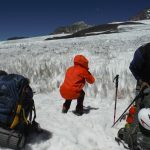 Scheme: Trekking El Morado National Park, acclimatization. We head from Baños Morales to Cabrerio area at the San José de Maipo Valley endings. 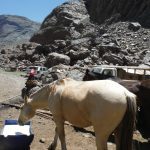 Once there, we load up the horses and then we head to our base camp (3.600masl). 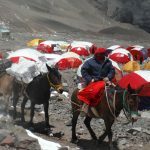 Scheme: Trekking approach and acclimatization, camp set-up, cooking. 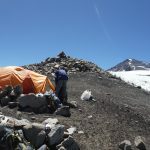 We move to camp1 (Plateau), place where we’ll be able to see for the first time Marmolejo’s summit. 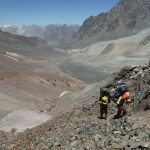 Scheme: Trekking approach to camp 1 with expedition bag-pack on, camp set-up, cooking, acclimatization. Scheme: Trekking approachto camp 2 with expedition bag-pack on, camp set-up, cooking, acclimatization. 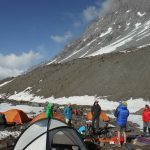 We’ll set up a third camp at 5100masl at the very glacier itself (Marmolejo glacier). Scheme: Trekking approachto camp high, with expedition bag-pack on, camp set-up, cooking, acclimatization. 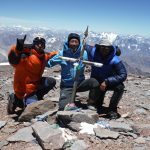 In this day, we’ll reach for Marmolejo summit peak, which is at 6.108masl, and then head back to base camp. We move to base camp with all gear. From base camp, we’ll head right back to Santiago. Scheme: Trekking, drive to your hotel. On this day the members are free to visit santiago and rest. 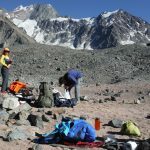 around 18:00 we will have a meeting to load our vehicles and drive by night to Mendoza with all mountain gear, with this we want to avoid lose any luggage in the airport. Scheme: Resting in Santiago, drive to mendoza by night in our vehicules, justr for HME satff and luggage of our members. 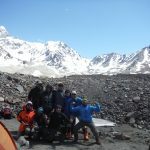 We travel at night to Mendoza in orther to get there in the morning to buy climbing permit. Scheme: Transport to Penitentes, get the climbing permit. At noon we’ll be ready with this paperwork, then we head to Penitentes village to spend the night at 3200masl. 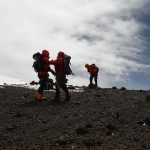 We’ll head towards Confluencia Camp where we’ll acclimatize in order to not force the body into critical conditions and thus have optimal chances of success. 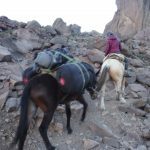 Scheme: Trekking, Camp take-up, cooking, acclimatization. We’ll start the approach towards Plaza de Mulas where we’ll set up the base camp. We’ll stay there for a couple of days. 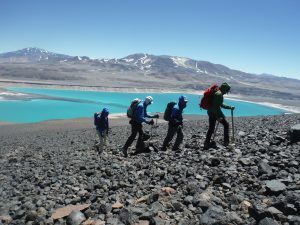 Scheme: Trekking, camp take-down and up, cooking, acclimatization. We’ll trekking to the next camp “Nido de Cóndores”. Then we’ll head back to base camp to spend the night. 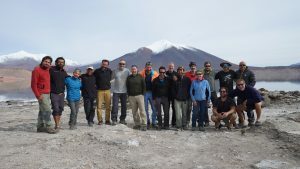 This is a key process to our expedition because we’ll get to a 5,300 masl and then we’ll head back to sleep at 4.260mts, which is optimal for acclimatisation work. From this point we’ll be at just one camp to the final camp, Colera Camp. 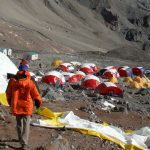 This camp is placed over the 5.900mts. 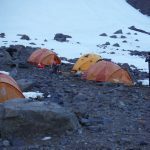 We’ll leave early morning in order to set up this camp and then spend the night at that altitude. 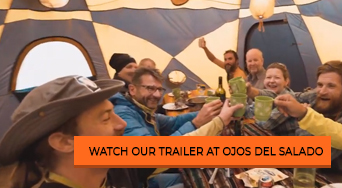 This camping is due to modifications according to the lead guide criteria which will take the possibility of reach summit or not from the Nido de Cóndores camp. This should be the most important day of our expedition, since we’ll take it to the Aconcagua’s summit on this day. From Berlin camp to the summit is about a 1.000mts upwards which can be overpass after 10 to 12 hours hike. 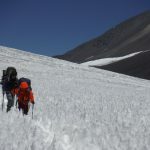 We’ll take down the high camp and head back to base camp (Plaza de Mulas). Scheme: Trekking, camp take-down and up, cooking. this will be our last day in the Park, in which we will take all our equipment in a 7 hours walk to the park entrance, where will be waiting our transport. The whole group will be driven to the airport. 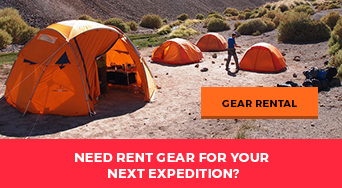 All group equipment; rope, high altitude tent, stove, GPS, etc. 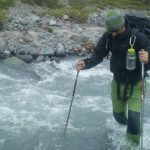 Traveling and rescue insurances. We strongly recommend you to get them. International and national flights and boarding fees. 2 persons per hotel room. Expenses in case of rescue or early departure from the expedition. Delays caused by your flight or any transportation issue which you are responsible for. 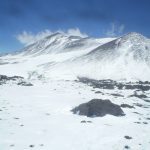 Weather changes which may affect the expedition. We strongly recommend to all the expedition members to have the mountain equipment described below.